Android [partially solved?] "BUILD SUCCESFUL" but crashes on startup? Discussion in 'Legacy GameMaker Community Tech Support' started by GreySilence, Feb 3, 2017. The game seems to compile properly, as there are no errors that show up when hitting "Run the Game" on GMS. It even says BUILD SUCCESSFUL. On my device, it just says "Unfortunately, <gamename> (As YoYo Runner) has stopped." and behind it, shows a confirmation window saying "Allow <gamename> (As YoYo Run... to access photos, media and files on your device?" to that I hit allow. After hitting allow, it crashes and closes instantly. Every time after that I've tried to start it, it would crash instantly too. But if I delete the APK off my device and try to run it again, I get the first thing happening once again. The game runs on windows and windows YYC (It's not an issue with the game's programming, it's simply a one-room game with one object that draws text saying "Hello World!"). It also lets me create an executable file if I select "Single runtime executable (*.exe)" but gives me an error "Error with Installer!" if I try to create it using "Windows NSIS Installer (*.exe)". It seems to let me create a .APK, which I tried putting manually on my phone, but after installing it, gets the same instant crash. BTW the APK was created using both "Target: Android/Fire" and "Target: Android/Fire YYC" and they both have the same crash. I tried giving the APK to my friend, but it crashes on his phone as well. I suspect that the created APK is broken, as he can run the game fine normally on his phone/computer with the project files. EDIT: Forgot to mention, Everything used to work fine for me a year ago, using the same phone on windows 7. Ok, I found a solution on another post lol. Just use the 32 bit NDK even if you're on a 64 bit system. Pretty sure I'm using the 64 bit JDK, but if it's still not working for you, use the 32 bit JDK as well. I have the same problem, What version of Windows do you have? I used to have windows 7 and it worked fine, But I recently Update my computer to Windows 10, Now Android export seems to not work. 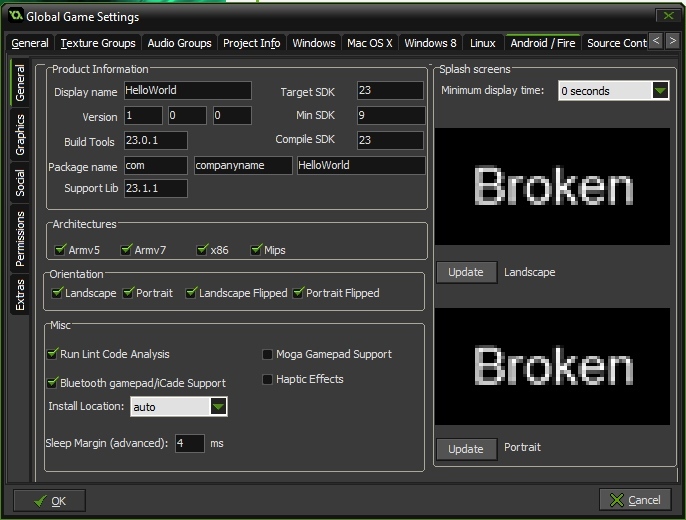 I mean, yes, there's no errors in game maker, but is something in the android export. I did the thing that you said, I changed the NDK and also the JDK... Didn't work. I'm going to install Windows 8! I'll tell you if it works in other operative system. What JDK version are you using? I think you should be using 8u102. 64bit and 32bit shouldn't make a difference and NDK only affects the YYC.